This is one of our major laboratories located in Florida. This garage laboratory is equipped with welding, lathing, and pressure tools. We are taking pains to organize so that mobility can be achieved. Since we have to store materials, and equipment in the same area, it makes it hard to find good experiment space. A few items of interest appear here. The first is our dear and beloved "psycho coil". This coil is amazing in its ability to find resonance. It will throw a 54 inch arc with only a single 15KV 60ma NST, Neon Sign Transformer, as the power supply. The NST is "unpotted" and adjusted by removing some of the windings to make the secondary output voltage closer to 14KV. The special gap mechanism, invented and patent pending at this shop, is called a vacuum gap, or sucker gap, and works by applying suction between two electrodes with a powerful vacuum motor. The maximum length of the spark gap arc can be exactly set, and the ions are immediately removed from a given discharge, providing the capacitors rise to a full charge during their cycle. 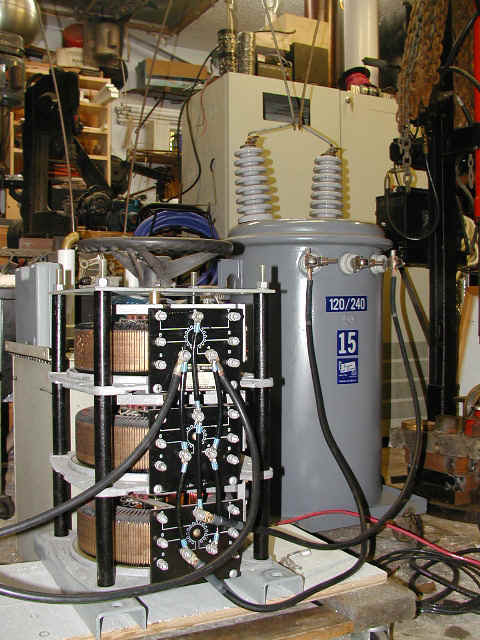 This type of spark gap is optimum for working with sensitive and expensive NST transformers. The psycho coil is a portable, very high powered, well engineered experimental Tesla Coil. In the foreground underneath the propane torch is a large Tesla Coil controller box. This is an experimental model for placing the different elements in different locations, and measuring losses due to component positioning. All of our creative development centers have piles of interesting components laying about. Note the double parallel vacuum gap on top of the stack of monster Maxwell capacitors. There is a nice set of 15KV 60ma NSTs on the lower rack. Maxwell is known as one of the best capacitor manufacturers for impulse and laser circuitry. We are absolutely in love with this super high power controller system. It is composed of a very overbuilt 15KVA pole pig distribution transformer that is being fed through an 150 AMP variac triple stack that is, in turn, controlled by a power controller unit. Backlash through the system on magnetic shutdown is corrected for, and the operator can safely run this power system at a distance. The pig transformer can be overdriven using the autotransformer step up built into the variac stack for that extra bit of higher potential.